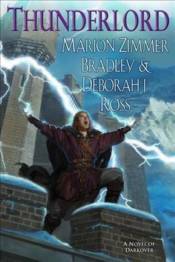 A follow-up to The Ages of Chaos omnibus, Thunderlord is a brand-new novel of the genre-bending Darkover universe, expanded by Marion Zimmer Bradley's collaborator Deborah J. Ross. Far in Darkover's past, the Ages of Chaos were a time of constant warfare, when immensely powerful psychic weapons ravaged the land and slaughtered entire armies. Perhaps none was more dangerous and unpredictable than the mental Gift to sense--and control--thunderstorms. When the realm of Aldaran and their Scathfell cousins came to blows, that Gift turned the tide of battle, and Aldaran prevailed. A generation later, the heir to Scathfell, Gwynn, has grown up in the shadow of that conflict, his life shaped by the loss of his entire family. Now he plots his revenge for his family�s humiliating defeat by seeking to marry a woman who carries the storm control Gift, so that his sons will be able to wield the terrible power of storms against Aldaran. Since childhood, Kyria has been able to sense approaching storms. She had never expected to marry a rich man; independent and athletic, she defied tradition by donning her brother�s castoff clothing and trapping small game to keep her family from starvation. When Gwynn�s emissary arrives with a marriage proposal that will secure her family�s financial future, she agrees. Along with her younger sister as her companion, she sets out for Scathfell, where she will be formally wed.
During their passage through rugged mountains, a blizzard drives them to seek shelter in a traveler�s hut, where they meet Edric, the young heir to Aldaran. Edric has inherited the storm control, but he has never dared to use it. His whole life, he has been warned against the consequences, not just to his enemies but to everyone he loves. Now, disguised as an ordinary traveler, he journeys home after years of study, disciplining himself to control his powers. When he meets Kyria, he senses the presence of the same storm power, but unschooled and dormant. They know each other only as Edric and Kyria--for under shelter truth, all identities are concealed--and are drawn to one another. Thus begins the saga of two kingdoms, divided by bitter history and present-day suspicions, one armed with devastating power and the other determined to overcome it, no matter what the price. Can their love and resourcefulness overcome even the overwhelming power of a Thunderlord?